How to create Excel 100% stacked line chart in C#, VB.NET? This article explains how to create a 100% stacked line chart in Excel using Syncfusion Excel (XlsIO) library. What is 100% stacked line chart? 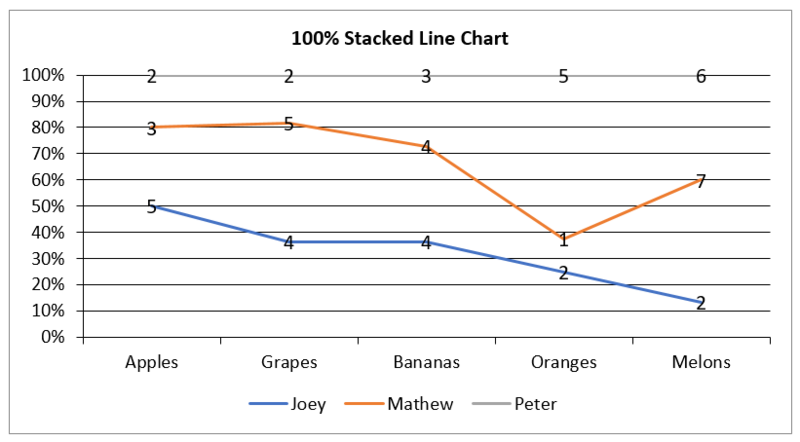 100% stacked line chart is a line chart in which lines do not overlap because they are cumulative at each point. In the 100% stacked line chart, the lines reach a total of 100% of the axis range at each point. This chart displays series as a line. Values are represented on the y-axis and categories are displayed on the x-axis. To create a 100% stacked line chart in Excel using XlsIO, you need to do the following steps. Create a chart object by calling the worksheet.Charts.Add method and specify the chart type to ExcelChartType.Line_Stacked_100 enum value. Add the basic elements like chart title, legend and datalabels. IsVarycolor (This property holds good for single series chart). Applying properties apart from the mentioned property might throw exception or the changes will not be reflected in the output document because those properties are not related to line chart. To know more about creating charts with various settings using Syncfusion Excel (XlsIO) library, please refer the documentation. The following C#/ VB.NET complete code snippet shows the creation of 100% stacked line chart using XlsIO. chart.ChartTitle = "100% Stacked Line Chart"